Lucy Jones, a fourth-generation Californian, is L.A.’s go-to quake expert whose calm presence soothes us when the earth moves. Update: Jones is now the director of the Dr. Lucy Jones Center for Science and Seismology. You’ll recognize Lucy Jones by her face, not her title. 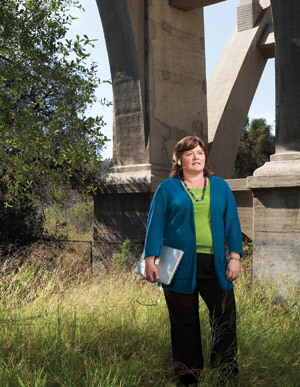 She is a seismologist with the U.S. Geological Survey and has been a visiting research associate at Caltech’s Seismological Laboratory since 1983. She’s often the first person you see on TV after a quake, explaining why your bookshelf just waltzed across the living room. Now she wants to help you get ready for the next one. Listen up: Earthquake preparedness starts at home. You’re famous for going on television after the 1992 Joshua Tree earthquake with a sleeping baby in your arms. One story I read said you even shushed a reporter to keep him from waking your son. That part is apocryphal, but it’s an interesting evolution of the story, and I have a theory about why. Here’s what actually happened: I do research on foreshocks, and I had co-chaired a committee to decide what we should be doing about earthquakes near the San Andreas Fault and the possibility that they would trigger something bigger. So in 1992, there was a 4.6 right by the San Andreas, and I came to work and left my husband home with the kids. Then the 6.0 happens at ten o’clock at night. My husband is a seismologist, too—he runs the seismic network at Caltech—so he grabs the kids, who were one and five, and runs in to work. Our younger son, Niels, had been sound asleep and was very grumpy about having been woken up. If we put him down, he screamed. If one of us held him, he didn’t. There was a computer crisis and my husband had to go, so he literally handed me the kids in the middle of an interview. We ended up making a statement that there was about a 15 percent chance of a San Andreas earthquake the next day, so the media were freaking out, and since it was based on my research, I kept on doing interviews and kept on carrying Niels. So what’s your theory on why the story has morphed into an exaggerated version? Even though we have both male and female experts who talk about this stuff, without question the women get remembered more. Because you feel better when Mommy tells you it’s OK. Women are more reassuring after an event. I’m pretty sure that’s why that image—me carrying my child—became so powerful. It also showed the reality of working motherhood. But then it became this symbol of “women can have it all,” which always made me feel bad because it doesn’t really work. We compromise. I felt like I wasn’t everything I could have been for my kids—and for my job. Soon after that I ended up going part-time. I worked part-time for ten years. That didn’t stop you from becoming lodged in the public’s mind as “the earthquake lady” from Caltech. It’s funny. I’m not the only person here who talks to the media. There are other people who do it more often than I do. My actual job is to run the Multi-Hazards Demonstration Project, whose aim is to use hazard science to improve a community’s resiliency for natural disasters. The project is an explicit attempt to make use of the fact that people recognize me to get the message out. The San Andreas Fault has to move. Most likely it will move in one big earthquake: a 7.8 or maybe even bigger. And when that happens—you’ll notice I say “when”—the lifelines that cross the San Andreas and come into L.A., all the major highways, the railway lines, all our natural gas pipelines, electrical lines, and water lines, will rupture. The chance of fires getting out of control is an extremely devastating part of this. Here are two pieces of advice: However much water you’ve got, store some more. And get a couple of fire extinguishers and make sure you know how to use them. Extrapolating from the 110 fires that occurred after the Northridge and San Fernando and Loma Prieta earthquakes, we have estimated that a big quake creating a strongly shaken hundreds of thousands of square miles will yield 1,600 fires. And you’ll need to fight those fires yourself. You have to be ready to do that. How much water do you have stored? We’ve got three big crates of the half-liter bottles plus a saltwater swimming pool. We have a system to distill the water and make it drinkable. That’s a big source of water. Are we crazy to live here? Actually, no. It’s a rational choice to live in Southern California because if you take the sweep of natural hazards that affect the country, you are no more likely to die from a natural disaster here than anywhere else. In fact, less so. We have an irrational fear of earthquakes, partly because they create a feeling of being out of control. We’re afraid of dying in them, even though the risk is extremely small. You’re almost undoubtedly going to live through it. And probably your house is going to be OK. It’s the aftermath that we need to prepare for. Your sons, now 20 and 24, are fifth-generation Californians. Your roots run deep here. My great-grandparents are buried on the San Andreas Fault, in Banning. When the Big One happens, they’re gonna be flying. What’s the first earthquake you remember? It’s one of my first memories of life. It was 1957, and I was two years old. We were living in Ventura, and there was a magnitude 5.1 close to where we were. I have a clear memory of my mom taking me, my brother, and sister into the hallway, and she had us cover our heads and she was on top of us. Our Siamese cats were screaming. They used to sleep on the TV because it was warm there. And when the earthquake started, they jumped off—thinking the TV was moving—but the shaking didn’t stop. So they freaked out and started screaming that special Siamese yowl. They never slept on the TV after that. Did you vow to become a seismologist at two? No. My father was an aerospace engineer at TRW, and he worked on the lunar escape module descent engine. So when we landed on the moon, when I was 14, I remember telling him I was going to be an astrophysicist and live on the moon. I thought that by the time I was this age, we would be living on the moon. You ended up majoring in Chinese at Brown University. How did that happen? Well, I was bored as hell at Westchester High School, so I took the SATs early, in tenth grade. Back then you could go to a UC without graduating from high school if you had high-enough SATs. So I was going to go to UCLA. But then my aunt and uncle, who were living in Taiwan, invited me to come live with them. My grandparents had been missionaries in China, and my dad was born and grew up there, and my uncles were both China analysts for the government. So instead of going to college at 15, I flew to Taiwan and went to Taipei American School. I graduated just after I turned 16. While I was there, I met Jimmy Wrenn, who taught Chinese at Brown, and he sent me an application. Growing up in L.A., I had never heard of Brown. I’d heard of Harvard. So I applied to Harvard and Brown and got into both. Well, actually, I got into Radcliffe, and it offended me that I couldn’t go to Harvard. My math teacher tried to convince me I should go to Radcliffe because they had a better class of men to marry there, and of course that would be why I was going to school: a Mrs. degree. I went to Brown. Mostly physics and math as well as Chinese language and literature. But along the way, at a brunch I attended because there was free food, I met a couple of geophysicists who said, “You don’t want to be a physicist. The only jobs are building bombs. Come into geophysics, and you can play in the mountains and get paid for it.” I didn’t take my first geology course until my senior year, but I fell in love with it. I read the textbook in the first week because I couldn’t put it down. It was so cool. It was explaining the world. I had been a classic physics snob—you know, “Rocks are for jocks. Geology isn’t a real science.” But suddenly I was hooked. I ended up doing my senior project on the evidence of earthquakes in ancient Chinese literature. So you head to graduate school at MIT and in February 1979 become the first U.S. scientist to enter China. Yes, in 1975, there was an earthquake in northeastern China with more than 500 foreshocks that as far as we could tell looked like it had been predicted. So when I applied to grad school in 1976, my adviser said, “Why don’t you start studying foreshocks, and then if China ever opens up, we’ll be in a position to send you over to study the Haicheng earthquake.” I spent five months there in 1979 and had three other trips over the next three years. We can do a good job of predicting where the next earthquake is going to be. For example, we’re not going to have an earthquake at 100 miles below the central United States. The only place you have deep earthquakes are in the slabs of a plate boundary. Similarly, the majority of earthquakes happen on active faults. As for predicting when, I can predict there will be an earthquake in California today, and I’m going to be right because I didn’t specify the magnitude. What we are trying to do is predict the time and the magnitude of a future event. We average about 30 earthquakes a day in California, and we tend to have two or three that exceed magnitude 5 every year. And when that happens, the rate of other earthquakes jumps up. We psychologically process it by assigning the name “aftershock” to them. But they’re still just earthquakes. Aftershocks are earthquakes we expect. You’ve advocated for developing a better system to alert people when an earthquake has started, giving them a few seconds to react before the shock waves reach them. Why would that be so helpful? It’s less an early warning than a just-in-time warning. In fact, the word they use in Japan, translated into English, is “now-casting.” It’s not a prediction. It’s that the earthquake is under way, and we’re determining that so quickly that we can tell you about it before the waves have gotten to you. We’re working hard at trying to do that, but we need a lot more money to do it right. You’ve used the example of a surgeon having just enough time to remove a scalpel from a patient. Right. You could move children under their desks, make sure they’re more protected from falling glass. In industrial settings you could stop pouring out a vat of chlorine, for example. What’s it like being a seismologist married to a seismologist? When you’re awakened by a jolt, do the two of you turn to each other in bed and say, “That was a 6.7”? 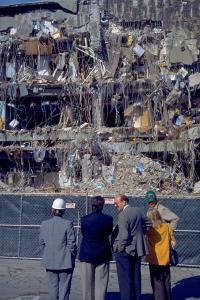 Are We Safer Than When the Northridge Earthquake Shook L.A. 25 Years Ago?